Posted on August 6, 2018 at 3:17 pm. Transition path sampling is most efficient when paths are generated from the top of the free energy barrier. However, complex (biomolecular) activated processes, such as nucleation or protein binding/unbinding, can have asymmetric and peaked barriers. Using uniform selection on these type of processes will not be efficient, as it, on average, results in selected points that are not on the top of the barrier. Paths generated from these points have a low acceptance probability and accepted transition paths decorrelate slowly, resulting in a low overall efficiency. The Spring shooting module was developed to increase the efficiency of path sampling of these types of barriers, without any prior knowledge of the barrier shape. The spring shooting algorithm uses a shooting point selector that is biased with a spring potential. This bias pulls the selection of points towards the transition state at the top of the barrier. The paths that are generated from points selected by this biased selector therefore have an increased acceptance probability and the decorrelation between accepted transition paths is also increased. This results in a higher overall efficiency. The spring shooting algorithm is described in more detail in a paper by Brotzakis and Bolhuis. This module was developed during the ESDW on classical molecular dynamics held in Amsterdam. Posted on April 4, 2018 at 2:13 pm. The contacts analyzed by the contact_map package can be either intermolecular or intramolecular, and can be analyzed on a residue-residue basis or an atom-atom basis. It also facilitates visualization of the contact matrix, with colors representing the fraction of trajectory time that the contact was present. Full documentation available at http://contact-map.readthedocs.io/. 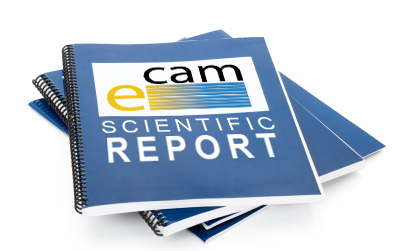 Information about software installation, testing and a link to the source code, can be found in our E-CAM software Library here. The practical application of this software module is the pilot project in collaboration with BiKi Technologies on “Binding Kinetics“, sustained by an E-CAM postdoctoral researcher at University of Amsterdam. The project aims at investigating the binding/unbinding of a selective reversible inhibitor for protein GSK3β. Contacts between a ligand and a protein are an excellent way to characterize “hotspots” – states where the ligand stays for a significant amount of time, but not nearly as long as in the final binding pocket. These hotspots are metastable states in path sampling, and should be treated with a multiple state approach. Therefore, attempting to identify those states would be a necessarily preliminary step to prepare the path sampling simulation. Other more general applications to this module include protein-protein aggregation or DNA-protein binding, as well as large scale conformational changes in biomolecules, such as protein folding. Posted on November 7, 2017 at 11:06 am. Module path density implements path density calculations for the OpenPathSampling (OPS) package, including a generic multidimensional sparse histogram, and plotting functions for the two-dimensional case. Path density plots provide a way to visualize kinetic information obtained from path sampling, such as the mechanism of a rare event. In addition, the code in this module can also be used to visualize thermodynamic information such as free energy landscapes. This module has been incorporated into the core of OPS, an open-source Python package for path sampling that wraps around other classical Molecular Dynamics (MD) codes . An easy-to-read article on the use of path sampling methods to study rare events, and the role of the OPS package to performing these simulations can be found here. A path density plot is histogrammed according to the number of paths, not the number of configurations. So if a cell is visited more than once during a path, it still only gets counted once. A path density plot may interpolate across cells that the path jumps over. This is because it is assumed that the input must actually be continuous. These differences can prevent metastable regions from overwhelming the transition regions in the plot. When looking at mechanisms, the path density is a more useful tool than the raw configurational probability. Module documentation can be found here, including a link to the source code. This and other software modules for studying the thermodynamics and kinetics of rare events where recently documented in deliverable D1.2. : Classical MD E-CAM modules I, available here. The path density is one of the most important tools for visualizing mechanisms, and is often one of the first things to analyze in order to draw scientific conclusions about the mechanism from transition path sampling simulations. This module was used to illustrate the differences between dynamics of the wild-type and oncogenic mutant forms of KRas, as part of one student’s master’s thesis and another student’s bachelor’s thesis at the University of Amsterdam. Results from those projects are currently in preparation for publication . Jan-Hendrik Prinz, David W.H. Swenson, Peter G. Bolhuis, and John D. Chodera. OpenPathSampling: A Python framework for path sampling simulations. I. Introduction and usage. In prep. Sander Roet, Ferry Hooft, Peter G. Bolhuis, David W.H. Swenson, and Jocelyne Vreede. Simulating the dynamics of oncogenic and wild-type KRas. In prep. Posted on October 23, 2017 at 9:28 pm. In the last few years, modelling of rare events has made tremendous progress and several computational methods have been put forward to study these events. Despite this effort, new approaches have not yet been included, with adequate efficiency and scalability, in common simulation packages. One objective of the Classical Dynamics Work Package of the project E-CAM is to close this gap. The present text is an easy-to-read article on the use of path sampling methods to study rare events, and the role of the OpenPathSampling package to performing these simulations. Practical applications of rare events sampling and scalabilities opportunities in OpenPathSampling are also discussed. Posted on June 5, 2017 at 8:03 am. This module, based on OpenPathSampling, calculates the flux out of a state and through an interface, or the rate of the transition between two states, while running a trajectory. For more information check the module documentation here.